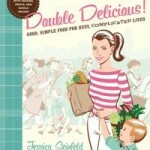 I’m so excited to give away a copy of Jessica Seinfeld’s new cookbook, Double Delicious, and to share with you a fun Q&A with Jessica herself. Through my publicist, I was lucky enough to submit my specific questions to Jessica who took the time to answer them – and I love what she has to say. 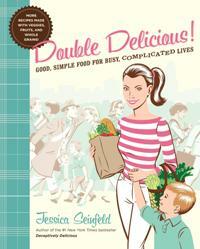 So read on for my fun Q&A with Jessica Seinfeld and then check out the details on how you can win a copy of her fabulous new cookbook, Double Delicious! In your opinion, what is the main obstacle to healthy eating in our country? Jessica Seinfeld: There are a lot of obstacles. One is the fact that produce and vegetables are often times more expensive than convenience foods. Healthier products are not as affordable as unhealthy products and that’s a shame. Also, food companies really market and advertise to people in an aggressive way – and ways that are not always truthful. They line the shelves with products that have claims on the front of the boxes that aren’t necessarily true. You have to be well-read and practically a scientist to understand what’s in a box. Tired, busy and hard-working people just want to put dinner on the table and don’t have time to go mess with all that. Do you have family dinners and if so, how often? Is it a goal to try for every day or is 3 days a week sufficient? With all the after-school activities and sports, is it realistic to have a nightly family dinner? Jessica Seinfeld: My husband travels every week – 3 days week usually. So when he’s in town, we make sure and have dinner together on all of those nights. It’s hard, I have the same problem with all the activities: I pick up my daughter from religious school, my son from baseball, we need to get homework done, get dinner on the table and then get kids to bed. I have 3 kids: a 10-year-old daughter and 7- and 5-year-old sons. So, I really try and prep dinner late at night or early in the morning so it will be ready when we are. What is your top tip for having a healthy snack on hand? Jessica Seinfeld: Keep fresh veggies cut up and in ice water all the time so you can put them on the table for snacks while making dinner – they will be crunchy and fresh so very appealing. Or use them to steam and have them for dinner. I also throw them in ziplock bags if I’m running to meet a kid: two chunks of carrots and a slice of cheese is a great on-the-go snack. My kids love veggies and know how imporant they are because they’re always seeing them in our home – they are always on the table and available so they are used to seeing them, eating them for snacks and they don’t fight it. What is your advice on dealing with relatives who give your children non-nutritious snacks? If it is once-in-awhile, do you let it go or set the rules? Jessica Seinfeld: I deal with it all the time with my family – they are constantly doing this to me. But it’s fine because I feel really good that my kids get to enjoy all kinds of food. My food isn’t uber-healthy – it’s delicious and nutritious. It’s not all brown rice and tofu. It’s just well-balanced. So I feel like if you feed them well at home, you don’t have to stress out about what other people give your kids – grin and bear it. Have your kids ever been to a fast food place? Jessica Seinfeld: They’re just not interested. I never had it growing up, we don’t eat it and they are not interested in it. My pediatrician taught me early on the best piece of advice: Don’t feed your kids food out on street or they’ll get into the habit of wanting food wherever they go. Instead, feed them at home. It’s such great advice. I didn’t take it so seriously at first, but now I see how great it is. My kids don’t expect everything they see, which is a good thing. 1) Leave a comment below with your favorite healthy snack. 2) Follow me on Twitter: www.twitter.com/LisaConsiglioR and tweet this contest and tag me when you do @LisaConsiglioR! 3) Become a fan on Facebook: http://www.facebook.com/WholeHealthDesignsLLC and share this contest with your Facebook friends! I will announce a winner on Monday, November 15th at 5pm. Good luck and thanks for sharing! What a great interview!! I love Jessica’s advice (through her doctor) on feeding kids at home, not out on the street, constantly, feeding!!! I agree that balance is important and that restricting certain foods to the point kids can’t eat with other families without wondering if they’ll be “in trouble,” because the food isn’t healthy enough can be as damaging to future eating as eating unhealthy foods all the time!! Great interview! Oh, and put me in the drawing…if I don’t win, I’ll put it on my Christmas list! You are in, Kathie! I am glad you liked the interview…Jessica has some great advice, doesn’t she. I try to make sure my kids mainly eat at home, but it can be so hard sometimes with all the busy schedules. That is a great tip I will try to follow! I am a Massage Therapist and with a busy schedule and often don’t have an hour for lunch. So I make sure to have healthy snacks that can be eaten one by one… cut up veggies and cheese or fruit and cheese. I LOVE mandarin orange season and will eat several of these throughout the day! Cashews & Almonds are another favourite. I can peel and eat a mandarin in my 15 minute break and still have time for changing sheets and receiving clients… I can pop a carrot into my mouth before they come out of the room! I always give my clients a glass of water when they finish and do the same for myself. This way I practice what I preach and keep hydrated while at work. Jessica seems very down to earth, I think her answer to your question about relatives feeding the kids junk is right on. I agree…we can’t be perfect, and I like they way she suggests to try our best. My parents and in-laws are wonderful, but when my dad gave my kids Frosted Flakes and put a tablespoon of white sugar on top, I almost died! (Sorry dad!). But Jessica has a point, if they are eating pretty healthy at home, just let go! Great questions, Lisa! I like her answers, too. I’d be interested to read her book because I’m not a big fan of being sneaky with healthy foods. My favorite healthy snack? Hmmmm… I guess peanut M&M’s don’t count? haha…. OK, how about apples with nut butter, or hummus and whole grain chips or carrots, or I love Siggi’s yogurt with extra fruit and granola. Melissa, I totally thought of you while I put up this post (remembering the day I asked you to bake your delicious cupcakes and sneak kale in it for me!). 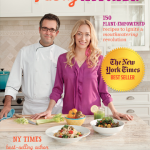 I know you will like her book…the apples and nut butter are a go to of mine. Great healthy snacks, Melissa! PS. I am a peanut M&M fan too! Love the idea about feeding kids at home. I wish my pediatrician had told me that 7 years ago! My favorite healthy snacks – carrots and hummus, string cheese, or for a treat – chocolate chips, almonds and craisins mixed together. That treat sounds yummy, Jodi! The pediatrician’s advice is spot on…as moms, we can be perfect, so at least if we try our best at home with healthy choices, we can relax more when the kids are out and about. Great snacks! I love the advice she shares from her pediatrician. Food is so available everywhere. What if kids learned the best food was at home? Now that would change society in so many ways!! Suzette, you are absolutely correct! Eating good whole foods at home can change the world. Learning to sit down and take our time to eat instead of in the car with a Big Mac can really change things. You are right, teaching kids while they are young that the best food is at home can be a key for change. What great advice from Jessica. I feel as if I kind of am too late for some of this though as my kids are 9, 11 and 13, however, one good thing I do that my kids love is that I keep a big bag of regular carrots in the fridge. Used to by the already pre-cut ones but they actually like to get out the big ones and peel them and eat them like Bugs Bunny! She has such great, solid advice and thoughts on this. I love her cookbooks! My favorite tip for a healthy snack is apples & cheese. My kids love these. And also those portable yogurts, so easy! I love her books, too! She is very realistic and understands how busy parents can be…she has a lot of practical advice and her cookbooks are great because the recipes are easy to follow. Great snack ideas, Crystal! Those Sea Gifts roasted snacks sound great! I will have to check them out for my kiddos. Yum! I agree with you, it is a relief to just not worry about what my kids are eating at parties, games, etc… I try my best and have to let go. Thanks for sharing your fav snack…will totally try it! I saw her on Oprah and actually baked a whole chicken based on her interview. It actually is simple and quick to make. My favorite snack is the old standard peanut butter, creamed honey and cinnamon sandwiches. I love it as much as the kids. A whole chicken! You rock, Carleen! I am sure it was delicous. :) Your fav snack sounds delicous. I will have to try it. Do you use sprouted or whole grain bread for the sandwiches? Yum! Thanks for sharing, Car! I love her advice! I have her first cookbook and my fave is her healthy mac n cheese with pureed white beans..yummy! My fave healthy snack for me is Lara bars (thanks Lisa!) and for my daughter, fresh fruit and string cheese..portable and healthy! Rice cakes toasted very quickly or not with peanut butter or for my little one who can’t have nuts yet: sunflower seed butter! You can barely taste the difference and it’s comparable in nutrition… also celery and same butters,(“muddy canoes”), string cheese and babybell cheeses rock, portable yogurts, and a variety of healthy cereal served dry on the run work well too… cinnamon graham crackers with cream cheese and strawberries on top are super delish… I have a coconut fruit dip that is great for fruits and my little ones have gotten into cukes, celery and carrots more with or without dill dip… all yummy! Heidi, my fabulous chef friend. You are AMAZING! Just love all your snack ideas for the kids. The sunflower seed butter is just da bomb! We love it at Ryan home, too. Heidi, you must write a book…your snack ideas are creative plus healthy. I am going to make the “muddy canoes” today! I enjoyed reading this!!! 🙂 our fav snacks are cheese and crackers! and juice! Carolyn, what kind of juice does your boy like? I typically dilute K & J’s juice with water. They like it that way. Your snacks sound great! Thanks for sharing! Great Q & A! Please count me in for this wonderful giveaway!! My 3 kiddos are super-active & love to play! We are on the go to practice of some sort quite often, so snacks that package nutrition AND portability rank pretty high-up with us. We’re big on fresh fruit, cut-up fresh veggies, almonds & Craisins mixed together, whole grain crackers and string cheese. Hi Jules, so excited about the contest! Your kids sound so cute…and I bet they love all the yummy snacks you provide for their games, etc… Portable snacks are super important, especially if you have active kids. Great snack ideas, Jules! That smoothie recipe sound great…YUM! We love smoothies at the Ryan household, so we will try it. I’m going to try that recipe! Sounds yummo!! My favorite healthy snack is the one that someone else makes for me.. otherwise it will never get made or eaten! Kym, I would love to make your snacks! What would you like?! With your busy life, you need to get some good fuel. Maybe apple with peanut butter? LOVE Deceptively Delicious and I can’t wait to get the new cookbook. My favorite healthy snack on the go is a Kashi Go Lean bar. Kashi’s got great stuff! Love their trail mix bars. The new book is so fab…you will love it! Thanks for sharing, Elizabeth! As the mother of a very picky 3 year-old, it’s tough to get him to try anything new (or even eat some of the favorites he had earlier in life- such as avocado). So I’m going to have to go with fresh fruit. Thanks for the great interview — and the contest!! The fresh fruit sounds like the best bet for your little one. I am impressed that he liked avocados! That is one of my fav foods these days. They say it takes 15 tries for someone to change their taste buds in adjusting to new foods. This is amazing, but I tested my kiddos and they are coming around with black beans and some greens (which they refused to eat!). Thanks so much for your post, Jenny! I just love my fans! You guys are the Absolute Best! Jessica sure does know her stuff…and I know you would totally be into her new book. I am like you, fruit tends to be my go to snack, and adding the almonds is so yummy. Love you, to my beautiful friend. You are rockin’ it with the marathon…so proud of you! just bought some sunflower seed butter today from Trader Joe’s. Can’t wait to try it w/ some apple slices for p.m. snack today. Great ideas!! I have a very picky 1-year old, and have been trying to find healthy meals and snacks for her. I have had great success lately with soups- vegetable and bean. So now I actually mix in more beans and veggies (canned) so that every bite has tons of good stuff! Hey, it’s better than trying to get her to eat chicken nuggets and pasta (neither of which she likes!)! I have also discovered dried fruit- all natural, no ingredients but the fruit and they are crunchy and delicious!! Sarah, what great snack ideas! That vegetable and bean soup sounds delish…what a super way to get some protein in your snack. AND your sweet girl is a smart one…not liking chicken nuggets is a good thing.Kate and Jack just love the dried fruit (even Kevin…he seems to eat a whole back of dried cranberries a day~which I do not suggest, but at least he is getting a healthy snack in! ).So good to hear from you, Sarah! Frozen blueberries, frozen peas, oat-o’s and shredded cheese. They could feed themselves, the frozen stuff felt great for teething and it required zero prep time. Ps they STILL (at 12 & 14) prefer their berries and peas frozen, much to my mom’s chagrin! Love it, Tania! I remember doing the same with Kate and Jack, esp. with the frozen fruit and peas…such a great idea for mom’s with toddlers and preschoolers (and so happy we are behind the teething days! Now on to boyfriends and girlfriends, but hopefully not too soon with all that). Thanks so much for sharing, Tania. Super ideas! I love the real-life practical advice that Jessica provides! Making sure the kids are making healthy choices and getting a balanced diet over the course of a week is my goal. We can’t be perfect EVERY day – what would we have to strive for?! Absolutely, Alison! We can only do our best…trying to give our kids healthy options as much as we can and letting go when we can’t is a good idea. You are so right-on! What great advice! I particularly like the advice about eating on the go. At our house we try to have a healthy snack before heading out to sports, errands, etc. Our favorite is sliced bananas, plain greek yogurt, mixed raw nuts and raisins with maple syrup drizzled on top. It keeps them satisfied for a few hours! Don’t you just love Jessica! She’s so practical which we need as moms. I absolutely dig your snack…we love Greek yogurt with nuts and seeds, bananas, but I never thought to add the maple syrup. Brilliant!I will try this with K & J…what a great wayt to use a natural sweetener. Great snack! Last night my daughter wanted a small pack of Oreo cookies. She is 3. I told her she could have it after a bananna. She bought into it-too cute-got full by the fruit and forgot the cookies. BTW- love the Greek yogurt idea- granola is our pick for yogurt and the grail mix for salads as yummy toppings! The Greek yogurt seems to be a favorite! Super idea about putting the trail mix on top of salads… the mix sure can jazz up the greens for the kids. I also like the way you gave your daughter a healthy snack choice and kids usually forget all about (well, some of the time!) that sugary snack they wanted to begin with. You rock, sista! We always have tons of fresh fruit and veggies within reach of little hands. I like to cut up celery, peppers, and carrots on Sundays so they are available for a quick grab after school. We love hummus and black bean dip too (ok, I do…I’m still working on my kids with that one). We also like all natural popcorn for a quick snack. Great job on the blog Lisa!! Thanks, Nancy! I forgot about the popcorn…that is an excellent snack and my kids love it. Preparation is the key to having healthy snacks on hand. I like your idea of getting the veggies cut on Sundays so you can have quick snacks to put out during the busy week. You ROCK…absolutely ROCK, Nancy! Great ideas! Lisa, some great advice coming in on healthy snacks. Myself I am a cruncher. I need to hear the sound of something crunching. Until lately I tried to go with a small bag of tortilla chips. Recently I have another snack. I take the “Ezekiel” Brand Tortillas found at http://www.foodforlife.com/product-catalog/sprouted-grain/ezekiel-49/whole-grain-flourless-tortillas and bake them for about 5 minutes at 350F. They become crisp and are actually pretty healthy, sprouts not wheat! Enjoy and keep up the good work. Hi Noah, great to hear your snack idea. I am a crunchy snack person, too. Give me some tortilla chips and guacamole, and I can go to town. I will have to try the Ezekiel tortillas~I am a sprout girl and love all their products! What a super fab idea! Thanks for sharing, Noah. Smoothies with bananas, strawberries, and blueberries are always a good snack. one of my favorite quick snacks is edamame! loved reading above what Jessica had to share! Hi Kate, the Detox Diva! Jessica has such down-to-earth advice. AND edamame is a great snack idea! With some sea salt, too. Love it! It’s was great for her to share what she gathers her family for dinner, My husband is out most days during dinner time, I can totally relate and see that it’s not a lost cause… just have dinner together the days that every one is at home. Hi Pat! You are absolutely right! I have to think that way too. Jessica offers good advice. We can be so busy with activities and work around mealtime, so planning to have family dinner when it is possible is a good idea. That way there is no guilt or stress involved. Thanks for sharing!